In this house, we like to joke that ketchup is a spice. Until no one’s laughing, and the children are gulping their glasses of milk like they’re going out of style. There’s a dominant palate in this house. One that firmly advocates a walk on the mild side. Seasoning is acceptable. Spice is not. So it was bewilderment I felt when my oldest child declared our recipe for shrimp tacos to be his favorite. He’s asked it be served at his birthday dinner for two years in a row now. The trick I’ve learned over the years is: whenever a recipe includes chili, cayenne, cumin or turmeric, ease into the seasoning. Usually I’ll start with about half of the recommended blend and – depending on how the aromas bloom – either add a little bit more or call ‘er done. This recipe offers all the versatility most families have come to expect from this dish: add the ingredients you love to make it as healthy or indulgent as you like. For an entree that’s both light and satisfying, this cannot be beat. note: in our house, the cumin, chili and crushed red pepper are halved in quantity. In a small bowl, combine all taco seasoning ingredients. In another bowl, place the shrimp. Sprinkle approximately half of the seasoning over the shrimp, and toss to coat evenly. Depending on your flavor preference, add more seasoning and toss again. In a large skillet, melt the butter. Add the onion, and sauté until onion is soft and lightly browned. Add shrimp to the pan, and cook until done, about 10 minutes. Serve immediately with your favorite taco toppings. 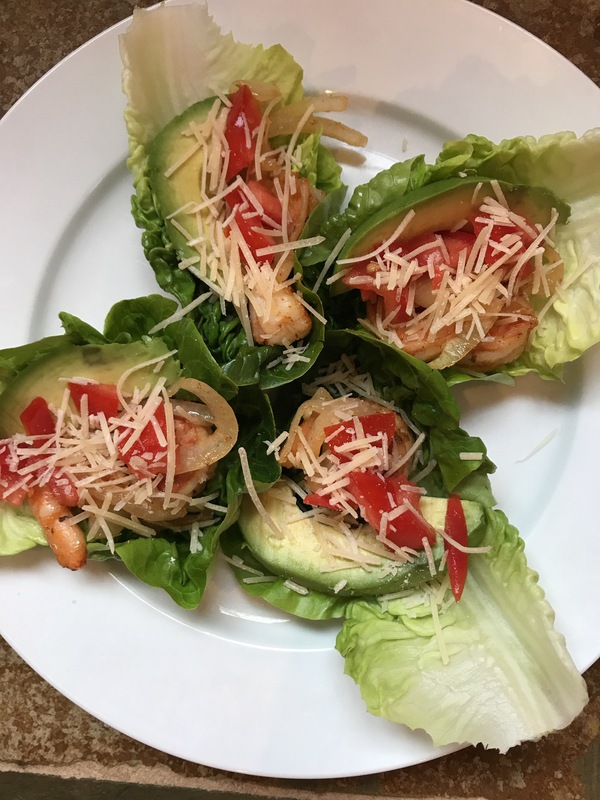 Feel free to use butter lettuce leaves in lieu of a tortilla, sprinkle shredded parmesan instead of a cheddar, add chopped tomatoes, avocado, a little cilantro. Squeeze a little lime juice over the mix to brighten the flavors even more.